This event ended on 22 June, 2018. Are you an artist, arts worker, community worker, curator, artist, filmmaker or producer? Are you interested in using critical practice to engage communities? Do you want to reflect on your practice with peers who work across the fields of art, community and culture? 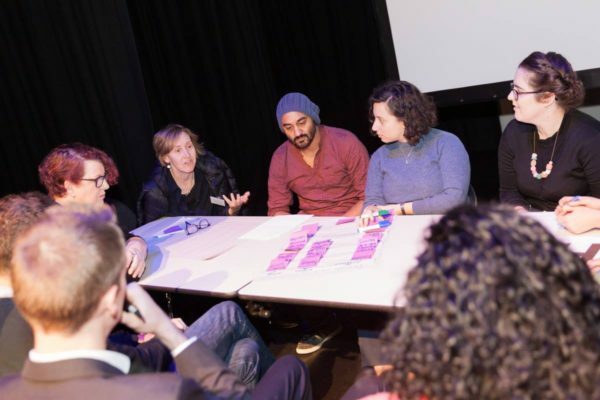 Presented in association with Information + Cultural Exchange, these free seminars explore the principles and practices of community arts and cultural development (CACD) practice and socially engaged arts practice and provide a space for discussion and reflection. Community arts and cultural development is a collaboration between professional artists and communities to create art. The creative processes underpinning the collaboration are based on the human rights principles of participation, accountability, non-discrimination and empowerment. Bookings essential by 5 June 2018 via Eventbrite or by contacting info@diversityarts.org.au. Priority will be given to people who live, work or study in Parramatta local government area, however there will be spaces available for people outside of the area. What is CACD practice? What is socially engaged art? What are the ethical imperatives of engaging communities in arts and cultural work? A dynamic three-hour workshop with leading CACD practitioner and recipient of the Australia Council Ros Bower Award, Dr Paula Abood in conversation with Jeremy Smith, Arts Practice Director — Community, Emerging and Experimental Arts, Australia Council for the Arts and artists (TBC). Assisted by Lena Nahlous, Executive Director, Diversity Arts Australia. Are you interested in developing visual art–based CACD programs with people in community? Have you thought about issues of power and privilege in your program design? With a welcome by Sophia Kouyoumdjian, Coordinator of Parramatta Artist Studios (PAS), this facilitated discussion between Dr Paula Abood, Artists and CACD Worker Marian Abboud, Eddie Abd and PAS artists will explore the idea of expression vs imposition. Includes a tour of PAS. How can you work in the screen sector using a CACD framework? What are leading practices to engage communities in filmmaking and screen storytelling? Facilitated by Dr Paula Abood, this session will feature a conversation with experienced CACD workers Colin Kinchela, Maria Tran and Barry Gamba. Wheelchair accessible. Please inform us of any accessibility needs, including interpreting in Auslan or languages other than English, which we will seek to meet. Dr Paula Abood Cultural Researcher in Residence. More on Maria and her film for Diverse Screens: The Subtractor, and SBS coverage of it. Eddie Abd is the Producer, Family Creative Hub at ICE and also an artist, a freelance designer and a facilitator of CaCD since 2009. Eddie has worked on a variety of projects throughout the Western Sydney region specifically engaging and facilitating art with young people, refugees and migrants. Colin Kinchela is a Gomeroi man, raised on Country in Tamworth, North-West NSW. Colin has a decade of practice and experience working in the arts sector including theatre, film, contemporary art and community radio. Notable companies include: Moogahlin Performing Arts Inc. (Sydney); Ilbijerri Theatre (Melbourne); Gadigal Information Service – Koori Radio 93.7FM (Sydney); Belvoir ST Theatre (Sydney); CarriageWorks (Sydney); PACT (Sydney); Bundanon Trust (Illaroo); The Red Rattler (Sydney); Sydney Festival. Jeremy Smith (Arts Practice Director – Community, Emerging & Experimental Arts – Grants & Engagement at Australia Council for the Arts) has broad experience working in community arts and fostering emerging and experimental arts practice. Jeremy has supported regional arts engagement and forged partnerships with diverse communities throughout his career, having held management and advisory roles in both the public and private sector. Sophia Kouyoumdjian (Director, Parramatta Artists Studios) is a highly respected curator with more than 15-years’ experience in the Western Sydney arts sector. She has been Coordinator of the Parramatta Artists Studios since 2011 and was previously Acting Director and Curator at Blacktown Arts Centre. Yamane Fayed (Producer, Multicultural Women’s Hub ICE) is an experienced trilingual educator and facilitator of digital and traditional storytelling workshops for diverse groups. She has worked as an educator in multicultural playgroups and a librarian with a focus on facilitating storytelling and story extension programs for children. Barry Gamba has 25 years experience as a community arts & cultural development worker and freelance screen producer. He has developed arts and media-based projects for agencies including the Ethnic Communities Council of NSW, Auburn Community Development Network, Fairfield City Council, Bankstown Area Multicultural Network, South West Sydney Legal Centre and NSW Refugee Health Service. As a filmmaker he has developed narrative-based information resources for stakeholders in the government and community sectors, and worked as a freelance script editor, an on-site script editor for Metro Screen and external reader for Screen NSW (formerly the NSW Film & Television Office). As a director, he has had films in official selections in International Film Festivals in New York, Chicago, Missouri and Toronto. In 1999 Barry was the recipient of a Fellowship from the Community Cultural Development Board of the Australia Council for the Arts. An initiative of Information + Cultural Exchange (ICE) delivered by DARTS with financial support from Parramatta City Council. ICE receives support from the Australia Council for the Arts and Create NSW.